Delete and restore your entire repo! 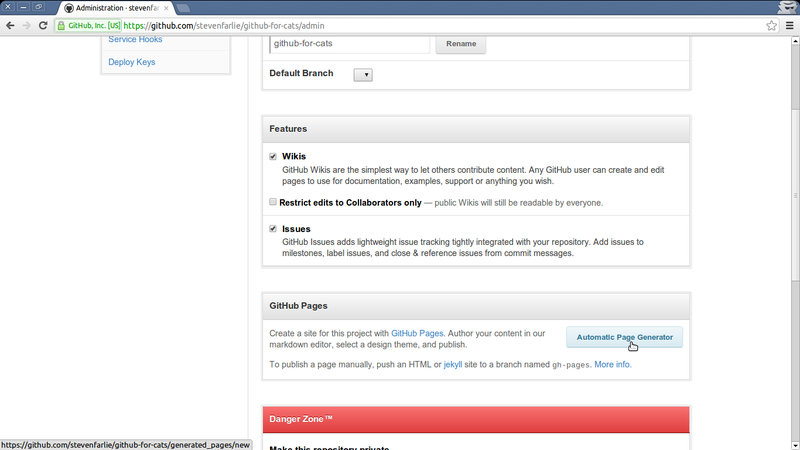 GitHub Pages allows you to host a website directly from your GitHub repository. 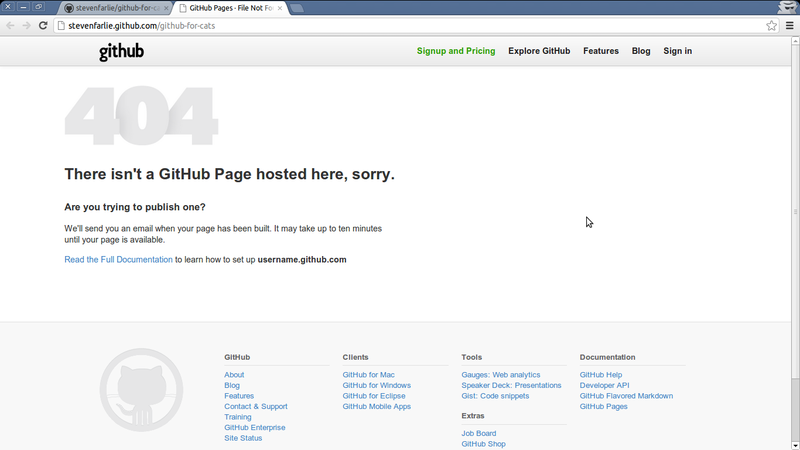 Your site will then be hosted under your own GitHub subdomain. For example, OpenTechSchool has the repository social-coding, which is automatically published to http://opentechschool.github.com/social-coding/. 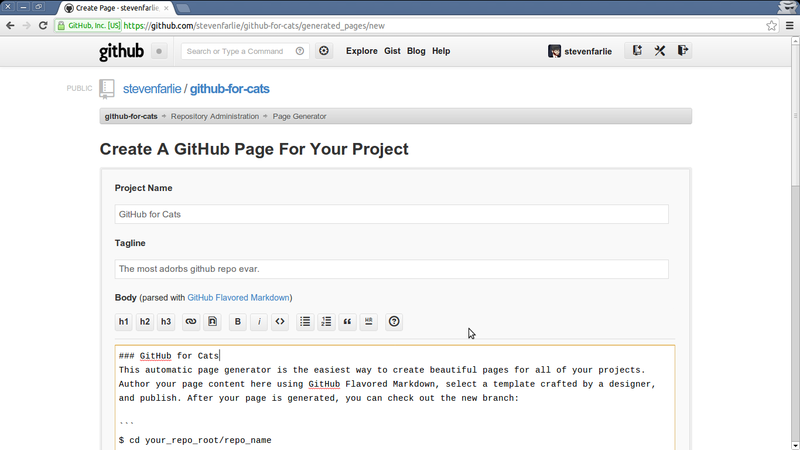 GitHub automatically handles the publishing and serving of the site. All we have to do is push to our repository on the gh-pages branch and GitHub will take care of the rest. There are a few different ways to get started with GitHub Pages, we’ll be looking at using the GitHub Pages wizard and rolling your own with Jekyll. 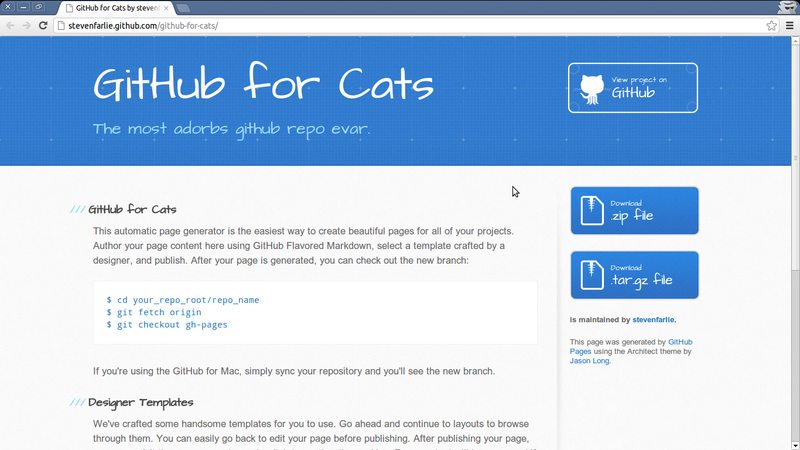 GitHub provide an automated system to bootstrap an empty repository for GitHub Pages. It allows you to pick from some premade templates so you won’t even need to clone your repository to your local machine. Create a blank repository. Any name will do. 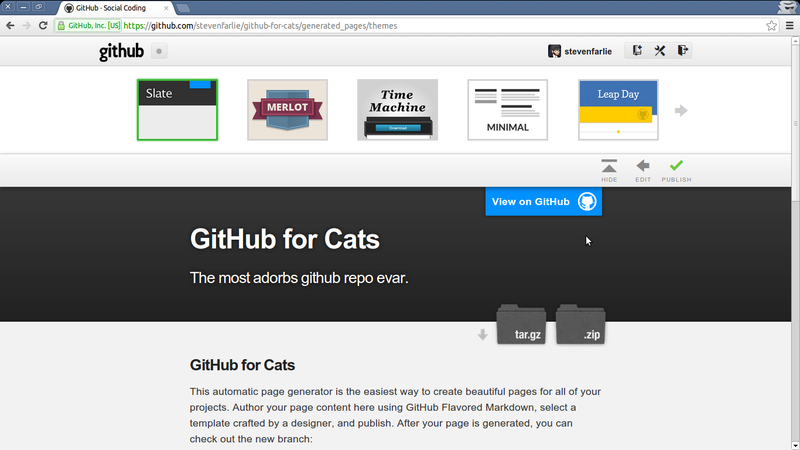 We’ll use github-for-cats as an example. The generator will build just the front page for you, but you can get a lot done here. Then the styles are all fancy and modern and new. Now you can look at your site online! Oh snap! Actually, you’ll might need to wait a while for the first time. But it’s worth it! After the first time it gets much quicker at publishing. 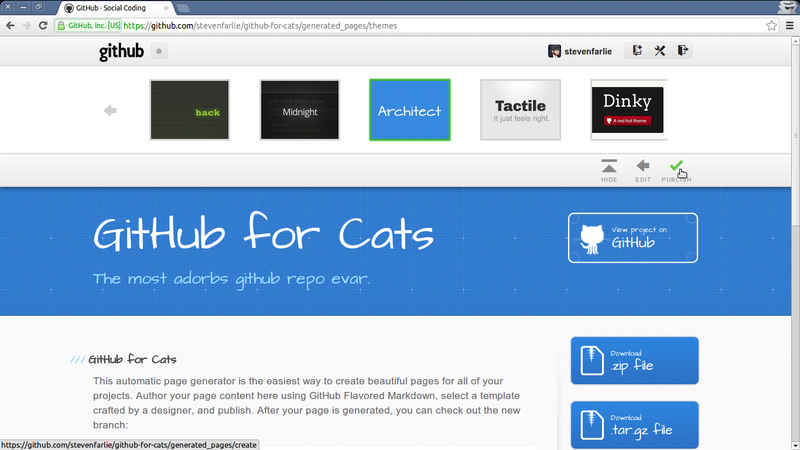 You can actually make a GitHub Pages site yourself with just a blank repository. It’s just a little more work because you’ll need to get all your HTML/CSS/JS yourself and commit it to your repo. The key thing to remember is that your site must be on the gh-pages branch. If you commit to the master branch, which is the default branch in git, then GitHub will not care. It only looks to see if you have a gh-pages branch (if it watched master it would try to publish almost every GitHub repo). 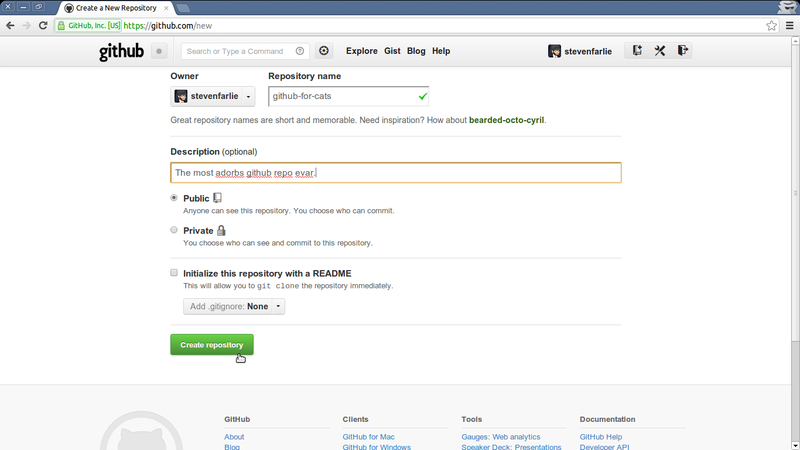 Start by creating a repository on GitHub and cloning it locally. Be sure to use your own URL to execute the clone command on. You can download a zip file with minimal website here. Unzip the files into your repository, then add and commit them. $ git commit -m "Basic GitHub Pages site"
Writing objects: 100% (5/5), 989 bytes, done. Things get even fancier with Jekyll. GitHub has native Jekyll support. It let’s you write pages in Markdown with simple templating and support for blog posts. It’s what we use at OpenTechSchool for our blog. You’ll need a Ruby setup to get the most out of it, and at least the jekyll gem installed. Maciakl has provided a simple Jekyll template here which you can use to get started. But be careful to switch to the gh-pages branch, because their repository is using master.